Known as the “Queen of the Gems,” pearls embody a timeless beauty that has been prized for centuries by many cultures around the world. The stone is a symbol of pure beauty, as well as a captivating symbol of femininity, wisdom, and nourishment. Pearls grow within sea animals such as mussels and oysters, and can occur in the wild or be cultured. 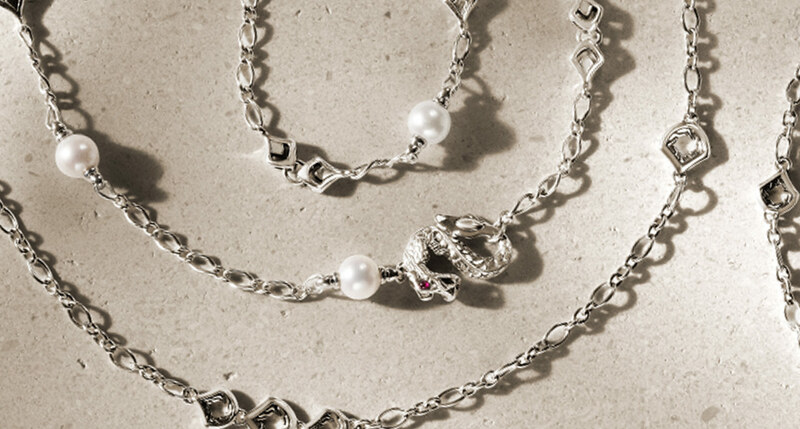 John Hardy select pearls with a high luster, which makes them intriguing and flattering to a broad range of skin tones. Pearls have been used throughout history to treat the skin, digestive tract, and muscular systems. The stone also has a mood stabilizing nature that is both soothing and spirit-building, keeping the wearer cool, calm, and collected. The energy within a single pearl is thought to have a magnetic power strong enough to balance the body and promote peace of mind. As both a water and moon gem—forming in mollusks over several lunar cycles—pearls are thought to enhance loyalty and truth, and dispel negative energy. Fresh and saltwater pearls in particular are said to have a powerful absorbing nature. When worn by someone in a state of bliss, the pearls become imbued with joy. There are many different types of pearls, such as South Sea, Tahitian, Akoya, and Freshwater. According to the Hindu beliefs, pearls may strengthen communication between this world and the next. Chinese, Egyptian and Persian cultures have long used pearls in jewelry and decorative arts, as well as in healing rituals.